This is not sake but "shouchuu" Japanese vodka, made from potatoes, wheat, or rice and distilled to a fairly potent 25 percent alcohol by volume. It is rumoured not to give the drinker much of a hangover due to its purity. It is drunk straight, with ice, or with hot water (for maximum effect). 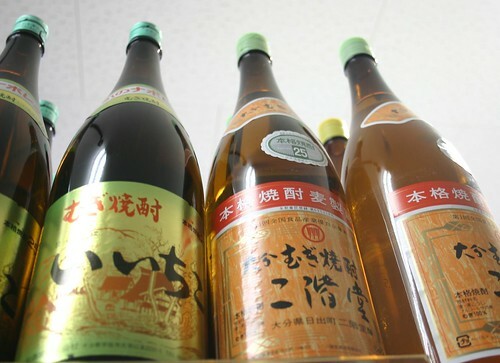 The Japanese are not ashamed to say that they drink alcohol for its effect. The bottles are big, and the consumption among middle aged men appears to be quite high. The brand names and logos of the products in the photograph are copyright their respective manufacturers.